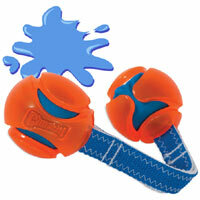 Chuckit Ultra Duo Tug rugged rubber tug toys for dogs. A tug toy for two dogs is always twice the fun. 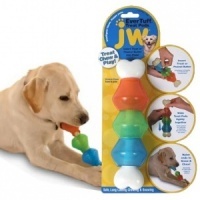 These tug toys are perfect for dogs who love to test their canine friends to the limit. Who will win? Let Chuckit Ultra Duo Tug decide. Natural rubber dog balls on a sturdy nylon tug strap. The balls are easy to clean and surprisingly light yet strong. 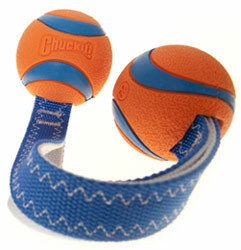 Chuckit balls are no ordinary dog balls. 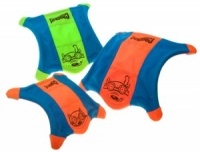 Dogs love their squashy feel and you will love their durability. Duo Tug is great for games of fetch, tug and many other interactive games with your dogs. Available in size Medium (two 2.5 inch balls firmly attached to either end of a strong nylon rope 9.5 inches long). 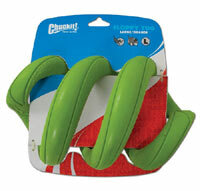 Chuckit balls are developed to have high bounce, high visibility and high durability. 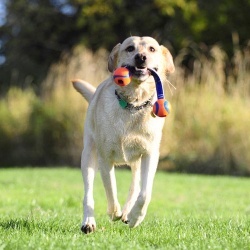 The value of Chuckit toys is easily recognized by dog owners. It will soon be your dog's favourite toy and because it endures you will love it too. 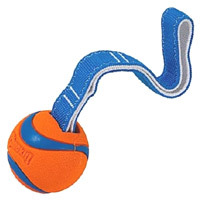 A great dog toy in its own right but also ball thrower compatible for amazing games of fetch. If buying Ultra Duo Tug for a Chuckit ball launcher, please check our size compatibility guide below. 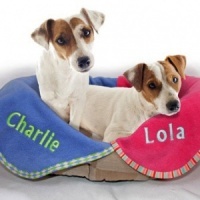 Highly durable, dog loves it! My German Shepherd tends to destroy toys very very quickly - this is surviving well and he absolutely loves it. Highly recommend! Hours of fun and three weeks in - still intact after three labs have fought over it and tried to destroy it as well! Her new favourite toy! Highly Recommended! 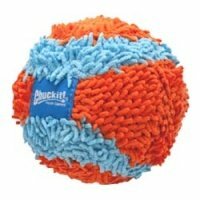 My girl loves her chuckit balls, however always wanted to play tug with them so I bought this. She loves it so much! It didn't take her long at all to learn it is called a "tuggyball" and she runs and gets it to play tug all of the time. Bought it for her birthday and it is lasting really well. Would highly recommend for those ball obsessed dogs!